Your home is your castle and when it is invaded by vermin, it makes feeling comfortable nearly impossible. Rats can chew through wood, drywall, and even concrete. Many feel like no area of their home is safe when pests are involved. Rats can be quite large and cumbersome. They can even climb into bed with your children and bite whomever they come in contract with. What’s even more horrifying is they leave a trail of urine and feces behind, and they cause many sanitary issues. There is a way to get rid of those rats once and for all with the amazing products we have found for you. No matter what your budget, you can find a solution. Because you shouldn’t have to share your space with nature’s most annoying pests, here are the best traps/device control systems on the market. If you want to rid your home of both rats and mice and don’t want any mess, this Rat Zapper can do the job. What is the Rat Zapper? It’s not one of those expensive ultrasonic devices that claims to work but doesn’t do a thing. This device used ordinary bait or pet food to lure in the prey into the inner chamber. Though the power of electricity, you can deal with the mice or rats that plague your space. This machine uses a powerful jolt of over 8,000 volts of electrical energy to safely euthanize pests. There will be no blood or gore, and certainly no mess for you to clean up. It is an earth friendly way to handle an age-long problem. Better still is that fact that it doesn’t use messy traps and other poisons, which are dangerous to pets and children. Who wants toxins in their home anyway? If you are concerned about the environment, this is one zapper to check out. Another thing that makes the Rat Zapper an attractive purchase is the fact that it comes with a 100 percent customer satisfaction guarantee. That means that you don’t have to worry if it doesn’t work for you; you can get your money back. You are out absolutely nothing to try it out. Many customers love the fact that there is no mess with this unit. Nothing is worse than an old metal trap that leaves a huge mess on the kitchen floor. These units are designed for a quick use and a snappy clean-up. 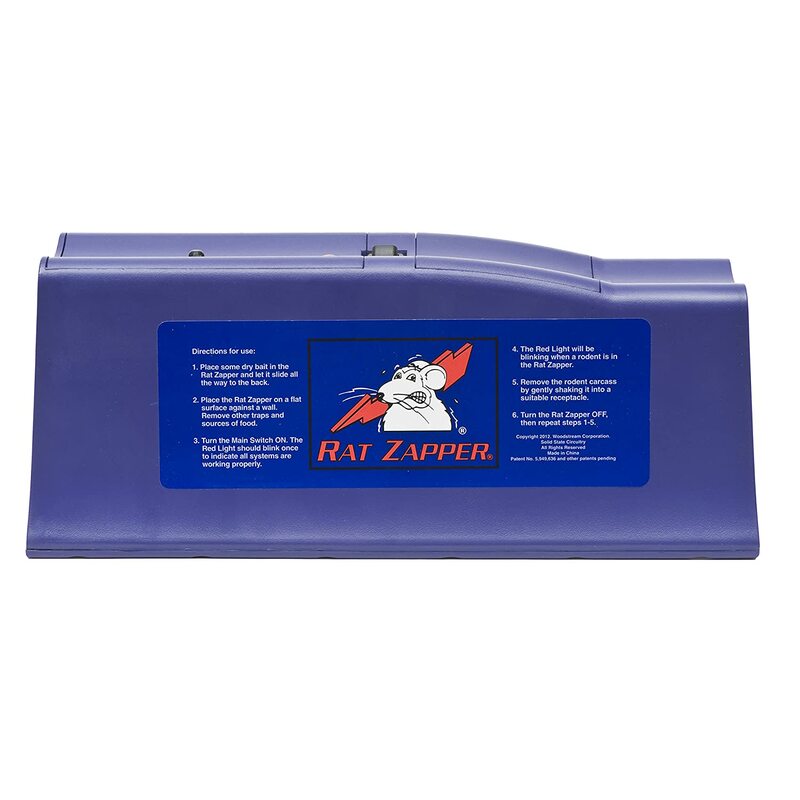 If you are tired of dealing with rats and your home has been invaded far too many times; the Rat Zapper may be the humane option you are looking for. The Victor Company did a great deal of research to create a product unlike anything else in the pest control line. Most people want to use the most economical way to dispose of these pests. Because this unit has a strong and deadly shock, it is a safe way to get rid of a horrible problem. If you’re tired of rats chewing through walls, rummaging through your groceries and turning your home into a playground; the Rat Snap is what you’ve been looking for. Because of the design style of this trap, you can fill it with cat food, dog food, cheese or peanut butter. 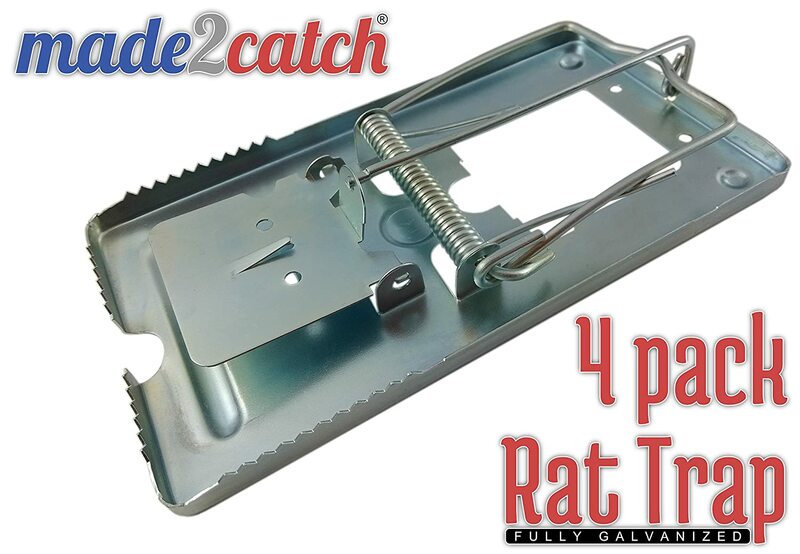 This allows you to adjust your bait according to what your rats are eating. It’s one of the smartest traps on the market. Set up of these units are easy. Make sure the trap is disabled, and then place the bait on the metal pedal. It is important to note that using a q-tip or another device to spread the bait is important. When a human’s scent is on the trap; the rats will steer clear. If you want to ensure you get your catch every time, use another device to spread the peanut butter, hazelnut butter, or cheese. After the bait is loaded, you pull back the kill bar and attach it with your thumb. Use multiple traps in high rodent activity areas. High success rates have been reported with just one night of use. They can work great in a barn, kitchen, bathroom, garage or even an office building. It’s an inexpensive and easy way to deal with a rat issue. 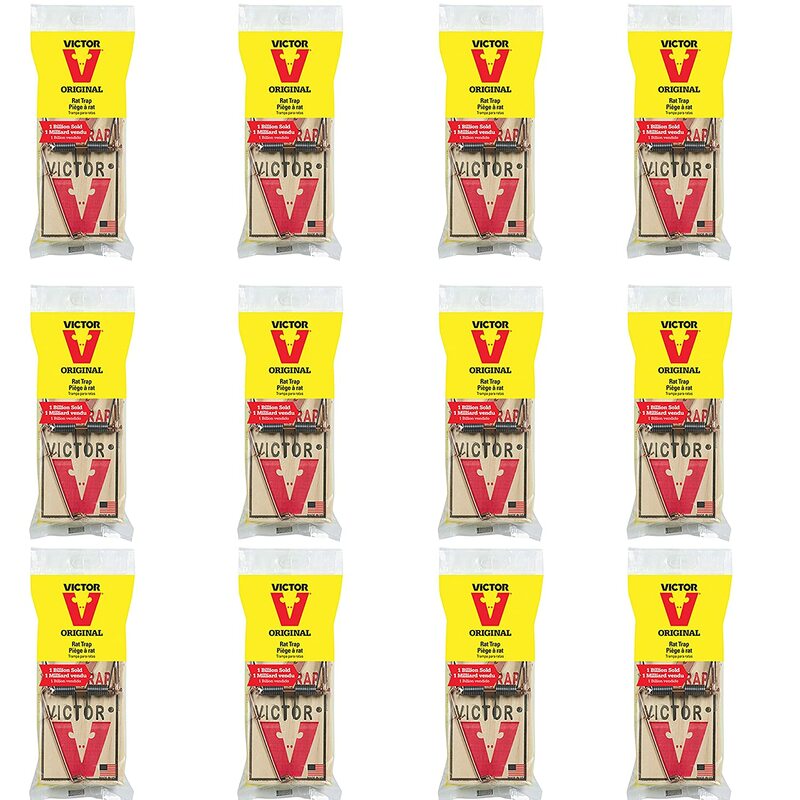 Victor is a leader in the rat trap industry. They have sold more than one billion of their metal pedal rat traps since the inception of the company. It’s the one that most homeowner’s prefer for an effective trap that offers a simple and straightforward design. When it comes to rodent control, this product is made in the USA and also FSC certified. It’s one of the most respected companies in the industry. 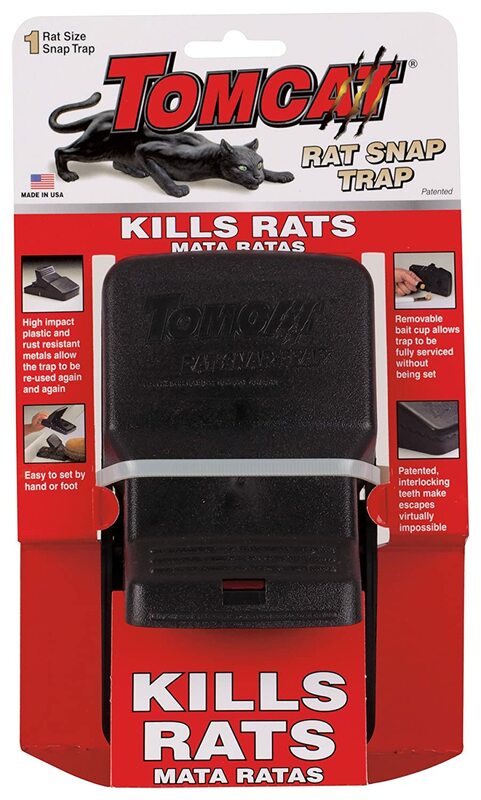 The platform of these rat traps are made from environmentally responsible wood. This wood has been certified by the FSC to ensure that forests are managed responsively. Customers love that they can place these traps against the wall and load it with bait in a snap. The most commonly traveled area for a rodent is along the wall. If the rat infestation is a large problem, putting multiple units out will only help clean it up quicker. The budget minded person will like the fact that these come in packs of 12, so multiples won’t break the bank. When people look to methods to get rid of rodents, they often turn to an extermination company. These methods provide a safe disposal system that means you don’t have to touch the rat. In some systems, you don’t even have to see it. The chances of them getting away are nearly none with these revamped styles. Professional services can cost hundreds, if not thousands of dollars. These methods are all very cost friendly. From the budget busters to the more high-tech electric models, all of them are affordable.